Israel Accuses World Vision Employee Of Embezzling Millions For Hamas : The Two-Way Israel said it arrested a senior World Vision staffer in Gaza and accused him of funneling funds to the Hamas militant group. The Christian charity said it has "no reason" to believe the allegations. The office of the World Vision, in east Jerusalem. A senior staffer in Gaza was arrested in June and indicted on Thursday. Israel has indicted the Gaza director of World Vision, one of the largest charities in the world, accusing him of siphoning off tens of millions of dollars earmarked for the people of Gaza and sending it instead to the Hamas militant group. Mohammed El Halaby was arrested June 15 and charged on Thursday with "providing support to Hamas." World Vision said in a statement that it will investigate the allegations against Halaby. But the Christian charity, which focuses on children, said its operations in Gaza have been audited and that "based on information available to us at this time, we have no reason to believe that the allegations are true." The allegations by Israel's Shin Bet internal security service describe complex, decade-long efforts to use World Vision as a front for Hamas' military wing. And entire lists of aid beneficiaries were fictitious, so instead of giving money to needy farmers, the money was handed out to Hamas members. Hamas spokesman Hazem Qasim told NPR that the allegations were made by "an enemy entity that has no credibility at all to us," and that "Israel is trying to make fake media wins." Pressed on whether Halaby was a member of Hamas, Qasim declined to comment. Halaby's father Khalil was more explicit, describing his son as secular and "not related to Hamas." He accused a disgruntled former World Vision employee of maligning his son, and said the accusations were an excuse by Israel to "stop the humanitarian assistance for Gaza." Israeli officials dispute that, saying they want aid to reach Gaza — without getting siphoned off by Hamas. But the scandal could complicate reconstruction efforts that are long delayed and badly needed following the 2014 Gaza war. That's because Halaby is accused of working around extensive audits and checks that World Vision imposes on its own programs. As a result, international aid officials and Israeli analysts predict that Israel and international donors will increase pressure on aid groups to improve those checks — which will cost money and manpower, and could strain the organizations' ability to operate. 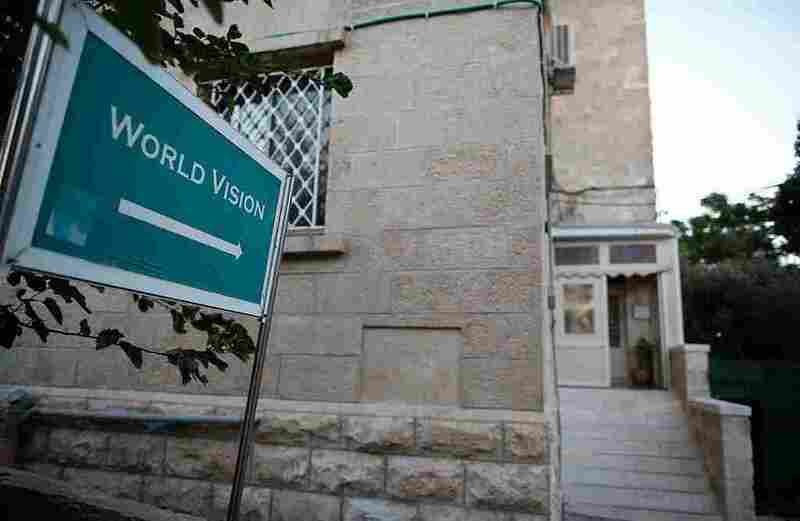 In fact, the impact on World Vision's efforts was swift: Just hours after Israel's announcement, Australia suspended aid to World Vision for the Palestinian Territories. "They're going to have to vet key people. They're going to have a better means of tracking," Gerald Steinberg, the president of NGO Monitor, a pro-Israeli group that scrutinizes aid to Palestinians and will be among those applying pressure on groups to remain clean, told NPR. "Humanitarian aid agencies don't like the idea they're going to have to have cameras all over the place to monitor how their money is being used, how their aid is being used, but that's exactly what they're going to have to do." In total, Israel said more than $7 million per year — 60 percent of World Vision's annual budget for the Gaza Strip — was diverted to Hamas. World Vision has more than a billion dollars in worldwide annual operating revenue. The organization's programs in Jerusalem, the West Bank and Gaza Strip include counseling hundreds of pregnant women on childhood health, providing training for language and math teachers, and leading vocational training for young people.